Do you have so many scraps from your friends that it's sometimes tough to know which scraps go with which conversation? 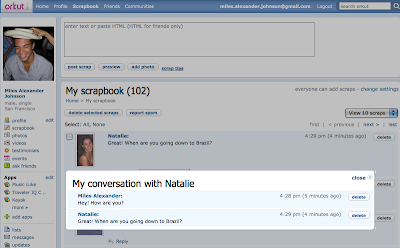 To help you keep track of your scraps, orkut now lets you follow any of the scraps in your or your friends' scrapbooks in a conversation view. Just click on the "view this conversation" link below any scrap that has been replied to, and you will see the back and forth scraping that you and your friends have shared. All replies are connected to the original scrap, so you can view them in sequence.